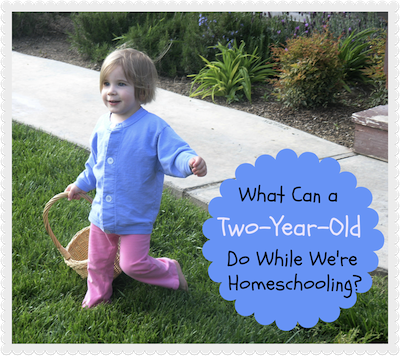 Many homeschooling moms I know are frustrated by the constant activity of the under-three crowd. Normally their busyness is just exhausting, but in a homeschooling household, their activity can thwart an entire day begun with good intentions. Back in 2006, I decided to track what our two-year-old was doing while the rest of us tried to accomplish school and life. I've reworked the post from January 2006, updating it to be helpful now. Affiliate links included. What can a two-year-old do to keep busy and stay out of trouble but still be learning, thriving, and contributing to a household? Breakfast- Breakfast is a marvelous time to be strapped into a booster or a high chair. Chatting, eating, participating with the rest of us -- breakfast allows me time to read a devotional or some Bible verses, and a two-year-old can be content there for at least ten minutes. If you get more time, that's a bonus! Circle Time- Two-year-olds belong on my lap during Circle Time, even though they can be exceedingly wiggly. It's great practice for doctors offices and other situations that require little ones to be still and happy. Same time rule applies to breakfast; ten minutes is great and anything more is a bonus! Many more Circle Time ideas in a post called Solutions for Circle Time: What Can the Under-Three Crowd Do? Room Time- We put a safety gate up and little ones have free play in their room for about 30 minutes. When it's time to come out, they pick up the toys with me so cleaning up becomes a habit. A little mom-mercy goes a long way when picking up a room. Those messes can be completely overwhelming to a small person, so just scoop up some toys alongside of them. I am usually the winner in the pick-up-the-room competition, but they are so grateful and it's about creating habits, not perfection. Stroller Ride- One of the older children takes a little one for a stroller ride around the property. This can last anywhere from 10-45 minutes, and if you don't have an older child who can reliably do this, it might be a great break for you! Lunch- Same applications as breakfast. Captive audience, so picture books are great during lunch. Nap- We've always required anyone under five to have a nap or rest time on their beds. Some have slept, others have not. It's okay; there's still a quiet hour or two where everyone can regroup. Video- 30 minutes. Do you have favorites? Some of ours are Charlie and Lola, What's in the Bible?, and Signing Time. Table Time and Snack- We eat dinner late, so a little snack tides us all over. It also keeps little ones busy and near me while I prepare dinner. You can do this, mama! The little years really do slide by, and soon they'll be your big kids. Soon you'll be teaching them to drive -- yikes!